Numerous motion picture appearances, countless television shows, sitcoms and standup specials, a talk show, three radio shows, and two books. Cedric ‘The Entertainer’, Eddie Griffin, D.L. Hughley, and George Lopez have been breaking ground in the comedy business and bringing the laughs for decades. This is a once in a lifetime chance to see five members of comedy royalty come together for the comedy event of the year ‘The Comedy Get Down’. George Lopez’s multi-faceted career encompasses television, film, standup comedy and late-night television. For two seasons, Lopez hosted Lopez Tonight, a late-night television talk show on TBS, which represented Lopez's return to series television after co-creating, writing, producing and starring in Warner Bros. Television's groundbreaking hit sitcom George Lopez, which ran for six seasons on ABC. George Lopez remains a hit with viewers in syndication on both broadcast stations and cable's Nick at Nite, ranking as one of the top-rated shows on the network and among the top five comedies and top 20 weekly programs in syndication. George Lopez is one of only four off-net comedies to post weekly ratings gains among households from the 2007-'08 to 2008-'09 season. Lopez is currently on his standup comedy tour, The Comedy Get Down, with Charlie Murphy, Eddie Griffin, D.L. Hughley, and Cedric the Entertainer in arenas across the country. Lopez is also starring in his new comedy series, Lopez on TV Land. Starring and produced by Lopez, the series explores how he struggles between his two worlds and crises that are often of his own making. The half hour single camera serialized comedy consists of 12 episodes. Lopez was last seen in the Lionsgate inspirational drama, Spare Parts. Produced by Lopez, the film is based on a true story about four undocumented Mexican-American teenagers from Phoenix who team up to build an underwater robot that wins the national robotics competition. In 2014, Lopez starred in the multi-camera ensemble comedy Saint George on FX, which he co-created. A popular comedians turned actor who started his career on-stage as a dare, funnyman, Eddie Griffin has built an ever-growing fan base since jumping onto the comedy scene in 1990. Born in Kansas City, Missouri, Eddie was voted class clown three years in a row in high school. His first love was always dance and by the young age of 16, he opened his own dance studio and was choreographing the Kansas City Chiefs half-tie shows. But all of that would soon change when one night his cousin dared him to go on stage at the local comedy club Sanford and Sons where he was told to do 3 minutes. HE performed off-the-cuff for 45 minutes successfully. It was then that Griffin purchased a one-way ticket to Los Angeles to pursue his dream of becoming a stand up. In only one short month, he was a regular at the renowned Comedy Store, where he was compared with esteemed talents such as Richard Pryor, Redd Foxx, and Lenny Bruce. After only two short months, Griffin was chosen to open for Andrew Dice Clay at Madison Square Garden that kicked off a 22-city tour. These many successful performances led Eddie Griffin’s appearance on Russell Simmons’ Def Comedy Jam (1992), the Cable Ace Award nominated HBO special One Night Stand (1992), HBO’s Comedy Half Hour Special (1995), the HBO special Voodoo Child (1997) and onstage at the legendary Apollo Theater. He also recorded the successful comedy albums Message In The Hat (1993) and The Message (1999) featuring comedic and musical performances by him as well as Master P, Silk the Shocker, and Fiend. Roles in such films as The Last Boy Scout (1991) Coneheads (1993), and Jason’s Lyric (1994) soon led to his own hit comedy series Malcom and Eddie (1996-2000), for which role he was nominated (1996) and won (200) the NAACP Image Award for Best Actor in a Comedy Series. In addition to lending his acting experience to this sitcom, he also wrote and directed for episodes, one of which starred his Godfather and mentor Richard Pryor. Armageddon (1998), and the worldwide successful comedy franchise Deuce Bigalow: Male Gigolo (1999) and Deuce Bigalow: European Gigolo (2005); as well as Date Movie (2006), Scary Movie 3 (2003), My Baby’s Daddy (2004) which he starred, wrote and executively produced for Miramax. Eddie Griffin also contributed and performed on Dr. Dre’s Multi-Platinum selling albums The Chronic (1992) and Chronic 2001 (2001). Eddie Griffin is widely known for his award winning Comedy Stand-up Special Dysfunktional Family (2003) which he started, wrote, Executive Produced and performed on the film’s soundtrack with Snoop Dogg, Dr. Dre and Tupac. Most of Eddie’s comedy specials and films can be found on Netflix, and are available for purchase on iTunes. Eddie’s last comedy special You Can Tell “Em I Said It premiered on Comedy Central on February 19, 2011. In June 2012, Eddie took a dramatic turn in David E. Talbert’s play A Fool and His Money in which he received rave reviews as the hero. Most recently Eddie was the voice of Richard Pryor in the animated series Black Dynamite on Adult Swim and starred in the R-rated comedy feature Mucho Dinero set to be released in 2016. Eddie latest feature film is titled American Hero where Eddie plays a wheelchair bund sidekick to Stephen Dorff’s heroic character to be released December 11, 2015. Comedy Central honored Eddie as one of the Top 100 Greatest Stand-up Comedians of all time. He has conquered not only the stage, but the silver screen as well, appearing in over 50 films and numerous television shows. In addition to his Comedic talent, Griffin is als a gifted Actor, Dancer, Choreographer and Singer. Eddie Griffin is a highly accomplished individual who has contributed significantly to the arts and the entertainment industry and is a star and gifted entertainer in the entertainment world. Currently, Eddie can be found four nights a week at the King’s room at Rio Las Vegas, and on tour during his days away from Vegas. 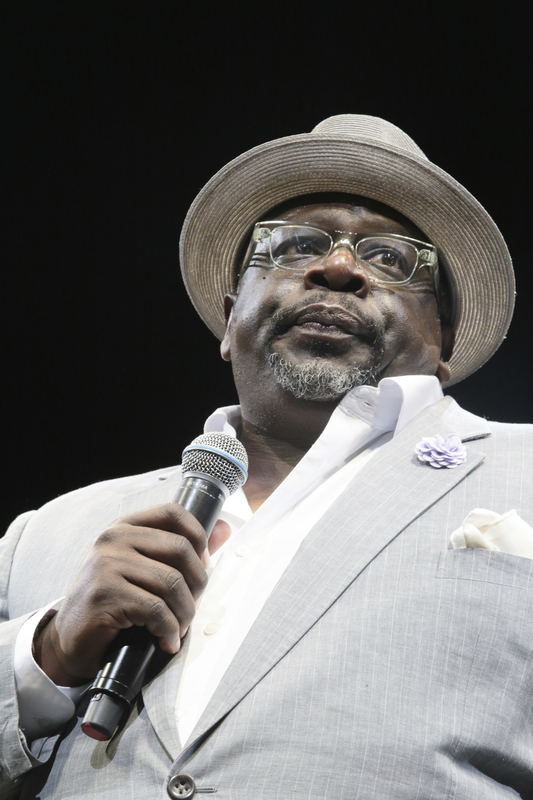 HE resumed his The Comedy Get Down tour with fellow standup performers, Cedric The Entertainer, Charlie Murphy, George Lopez and D.L. Hughley in April 2015. D.L. Hughley, star of his namesake TV show The Hughleys, is also well known as one of the standout comedians on the hit comedy tour and docu-film The Original Kings of Comedy. DL can currently be heard nationwide as host of his own nationally syndicated afternoon radio show The DL Hughley Show, heard in over 60 markets across the country. Known for being astute and politically savvy in true comedian style, Hughley is a published author, including his latest best-seller Black Man, White House: An Oral History of the Obama Years. He was honored with a prestigious Peabody Award for his satirical documentary special DL Hughley: The Endangered List, which earned him wide critical praise. Among his many TV appearances, Hughley appeared in the TV drama Studio 60 on the Sunset Strip and currently stars in the NBC drama Heartbreakers. DL stars in his ninth stand-up comedy special Clear, currently airing on Showtime. Marking yet another career highlight, on March 20, 2013, Cedric was named the new host of “Who Wants To Be A Millionaire,” joining the long-running iconic game show beginning its 12th season in national syndication. Cedric replaces Meredith Vieira, who launchedthe weekday version of the game show in 2002 and remained host for 11 seasons, through 2013. As for more big screen credits, in 2012 Cedricrevisited his co-starringrole in the DreamWorks Animation box office winner MADAGASCAR 3: EUROPE’s MOST WANTED. As a regular cast member of the mega-hit franchise, he once again lent his voice as “Maurice (the lemur)”. During that year, Cedric also starred along with JASON BIGGS in the political drama “GRASS ROOTS” directed by Steven Gyllenhaal ; as well as made a fun brief featured appearance with Christina Ricci in the romantic comedy “ALL’s FAIRE IN LOVE: Romance Has a Renaissance”. Later that same year, in June 2012, Cedric’s new comedy series “The Soul Man” debuted. It is a spin-off of “Hot in Cleveland” based on the funny quirky character “Reverend Boyce ‘The Voice’ Ballentine” a former R & B music star turned minister that Cedric portrayedon the hit “Hot” series. Popular comedic actress Niecy Nash shares the spotlight on the new sitcom co-starring as his wife “Lolli”. “The Soul Man” is createdby Cedric and Suzanne Martin (“Hot in Cleveland”). The show is currently celebratingits third season. Tagline: “He goes from Singing Soul to Saving Souls” (airs Wednesdays 10:30pmET/PT on TV Land).